OBJECTIVES: To define the patient population at Cape Town's district-level hospital offering specialist tuberculosis (TB) services, concerning the noted increase in complex, sick HIV-TB co-infected patients requiring increased levels of care. 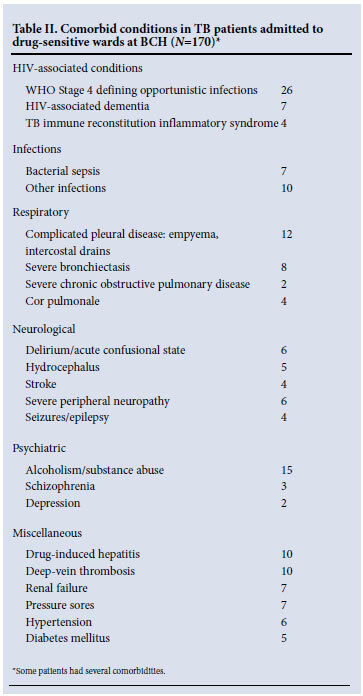 METHODS: A cross-sectional study of all hospitalised adult patients in Brooklyn Chest Hospital (a district-level hospital offering specialist TB services) from 27 to 30 October 2008. Outcome measures were: type of TB and drug sensitivity, HIV co-infection, comorbidity, Karnofsky performance score, and frequency and reason for referral to other health care facilities. RESULTS: More than two-thirds of patients in the acute wards were HIV-co-infected, of whom 98% had significant comorbidities and 60% had a Karnofsky performance score <30. Twenty-eight per cent of patients did not have a confirmed diagnosis of TB. In contrast, long-stay patients with multidrug-resistant (MDR), pre-extensively (pre-XDR) and extensively drug-resistant (XDR) TB had a lower prevalence of HIV co-infection, but manifested high rates of comorbidity. Overall, one-fifth of patients required up-referral to higher levels of care. CONCLUSIONS: District-level hospitals such as Brooklyn Chest Hospital that offer specialist TB services share the increasing burden of complex, sick, largely HIV-co-infected TB patients with their secondary and tertiary level counterparts. To support these hospitals effectively, outreach, skills transfer through training, and improved radiology resources are required to optimise patient care. Tuberculosis (TB) in HIV-co-infected (HIV-TB) patients is characterised by high rates of smear-negative pulmonary and extra-pulmonary disease, with increasing levels of antimycobacterial drug resistance and high rates of co-morbid opportunistic infections (OIs).1,2 Difficulty in making the diagnosis of TB in HIV-infected patients results in diagnostic delay and the need for increased hospital admission. Prior to the HIV era, South Africa's district hospitals that offered specialist TB services generally housed patients who were unable to mobilise and care for themselves or who required enhanced adherence monitoring, drug rechallenge for toxicity, or treatment for drug-resistant TB. At Brooklyn Chest Hospital (BCH), a district-level hospital offering specialist TB services in Cape Town, we have observed an increase in the complexity and severity of illness in HIV-TB patients in the HIV era. Anecdotal experience suggests that this complexity is in part due to mycobacteriologically unconfirmed TB, HIV-related comorbidity such as opportunistic processes or organ-specific damage due to the virus itself, and increasing case numbers of drug-resistant TB. In our experience, these patients commonly require upreferral to secondary-and tertiary-level services because, in part, of lack of training and specialised radiology services at the hospital. To investigate the complexity of patients at BCH, we performed a cross-sectional study to document patient types housed at BCH, their co-morbidities and their requirement for up-referral to other institutions. BCH comprises 271 adult and 56 paediatric beds. Patients receive inpatient care for TB and HIV care on-site. The highest staffing grade to oversee day-to-day care of patients is a medical officer. On-site radiological services are limited to plain X-rays; no computerised tomography or ultrasound is available. The Divisions of Infectious Diseases and Pulmonology from the Department of Medicine, Groote Schuur Hospital (a tertiary hospital), have provided specialist input and support to adult patients. Adult beds are divided into short-stay drug-sensitive, and long-stay drug-resistant, wards, the latter housing patients with multidrug-resistant (MDR-TB), extensively drug-resistant (XDR-TB) and pre-XDR TB (patients with M. tuberculosis isolates that are resistant to rifampicin, isoniazid and either a fluoroquinolone or one of the injectable agents amikacin or kanamycin, but not yet to both fluoroquinolones and injectables). We included all adult patients resident at BCH between 27 and 30 October 2008. Their case records were reviewed at the bedside by an infectious diseases specialist (HvdP). The following parameters were recorded: age, gender, duration of stay, site of TB infection, bacteriological confirmation of TB diagnosis, antimycobacterial drug susceptibility pattern, HIV status (if HIV-infected, use of antiretroviral therapy (ART) and presence of other OIs were recorded), acute or chronic co-morbidity, Karnofsky performance score, and the need for specialist referral or investigation not offered on-site during their hospital stay. Stata version 10 was used for statistical analysis. For comparative proportions Fisher's exact test, and for comparative means Student's t-test, were used. TB was treated as per national policy.3,4 On-site initiation of ART was introduced 6 months before the start of this study. The study was approved by the University of Cape Town's Faculty of Health Sciences Research Ethics Committee. A total of 244 patients were entered (Table I): 102 drug-sensitive ward patients and 142 in drug-resistant wards. 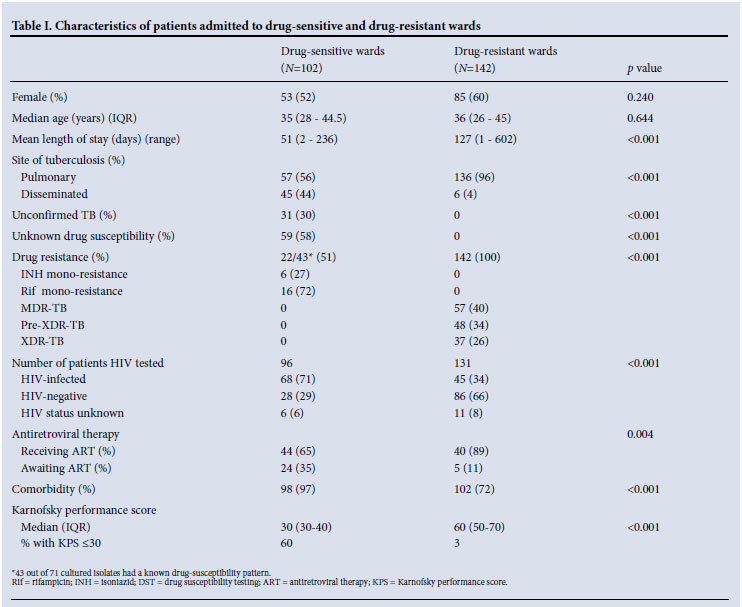 Drug-sensitive ward patients had high rates (71%) of HIV co-infection, low Karnofsky performance scores (60% qualifying as 'severely disabled' or worse i.e. Karnofsky score <30) and almost invariably (98%) had significant co-morbid conditions of which a significant proportion (22%) were related to advanced HIV infection (Tables I and II). Thirty per cent of drug-sensitive ward patients were on empiric anti-TB therapy with an unconfirmed diagnosis of TB. The diagnosis of TB was made on culture in 71 patients, 43 of whom had first-line drug susceptibility testing (DST) performed. In total, antimycobacterial drug-resistance to rifampicin was documented in 16 of the 43 patients who had DST done on the drug-sensitive wards. In contrast to the drug-sensitive wards, the complexity of patients housed in the drug-resistant wards related largely to antimycobacterial drug-resistance, including 60% with either pre-XDR-TB or XDR-TB (Table I). Unlike drug-sensitive ward patients, where nearly half had disseminated tuberculosis, the overwhelming majority in the drug-resistant wards had pulmonary disease (96%). HIV co-infection was present in 45 of 131 (34%) patients who had their HIV serostatus recorded. Patients had better Karnofsky performance scores (only 3% being classified as 'severely disabled'); however, significant comorbidity was recorded in 72% of patients who had one or more additional diagnoses requiring active management (Table III). Severe bronchietasis and drug-related toxicity were common, whereas comorbid OIs featured less prominently than in drug-sensitive ward patients, as fewer patients were HIV-co-infected. Partly as a result of the rollout programme of ART to inpatients at BCH, 84/113 (74%) patients who were known to be HIV-infected were receiving ART, the majority having started as inpatients. The remainder of co-infected patients were enrolled into the ART treatment preparedness programme. 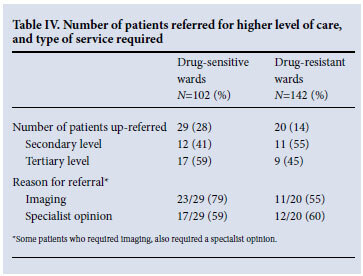 In total, 49 (20%) patients required referral to a higher level of care, the majority (69%) for imaging studies by either abdominal ultrasound or CT scan (Table IV). Patients in the drug-sensitive wards of Cape Town's district level, specialist tuberculosis referral hospital are predominantly sick, bed-bound, and HIV-co-infected; 98% of them have complicating comorbid infections and non-infectious conditions. Patients in the drug-resistant, long-stay wards have equally high levels of comorbidity, but less HIV co-infection. As testimony to the complexity of diagnosing HIV-TB, almost one-third of acute ward residents in this TB referral centre had not had their diagnosis of TB confirmed and were on empiric therapy. This figure is higher than the 15% of unconfirmed cases previously reported from the same hospital in 2003.5 In addition, Thanassi et al. documented an MDRTB rate of only 16% in BCH among 434 inpatients over a 6-month period during 2000, compared with the rate of 58% reported in this study. Furthermore, as pre-XDR-TB and XDR-TB are newly defined sub-categories of drug-resistant TB, the overall rate of drug resistance in patients managed at BCH in 2008 has increased significantly. We also found a considerable need for up-referral to higher levels of care, predominantly for radiographic imaging that could have been performed on-site were facilities available. Movement of drug-resistant TB patients to other facilities increases the potential for transmission of drug-resistant disease to HCWs and HIV-infected and -uninfected patients. Such movement of patients should be avoided wherever possible. Furthermore, ensuring that drug-sensitive and drug-resistant patients are managed in separate wards, while different categories of drug-resistant patients (MDR, pre-XDR and XDR) are also separated, is critical to prevent acquisition of a more resistant strain in hospital.6 The fact that 39% of patients with culture-proven TB in the acute wards had not had drug-susceptibility testing performed is cause for concern. We believe that drug susceptibility testing should be performed on all patients admitted to TB hospitals in South Africa. The profile of patients in BCH's acute wards is little different to that of TB inpatients at Groote Schuur Hospital, which is the central academic hospital supporting this primary-level facility (Mendelson M, unpublished observations). The high level of HIV-related comorbidity is a reflection of continued late presentation of HIV patients, in addition to the compounding problems of TB-immune reconstitution inflammatory syndrome (TB-IRIS),7 shared drug toxicities between antiretrovirals and antimycobacterials, and malabsorption of drugs in wasted, cachexic patients. The pressure on bed occupancy at tertiary and secondary level health facilities directly affects the duration of sick patients at higher levels of care, necessitating the transfer of some TB patients to district level hospitals prior to stabilisation. High death rates in HIV-TB patients are commonly due to other HIV-related conditions, particularly OIs,8 and managing such complex patients in facilities with medical officers that are inexperienced in managing HIV-related infections other than tuberculosis is a challenge faced by most specialist TB hospitals in South Africa. The increased awareness of drug resistance as a developing problem and the resulting increase in sensitivity testing of M. tuberculosis isolates by provincial programmes both for 1st- and 2nd-line drug sensitivity has resulted in an increase in the number of drug-resistant TB cases being identified. As it is mandatory for all pre-XDR-TB and XDR-TB patients to undergo inpatient treatment, this situation is leading to an increase in the number of drug-resistant TB cases managed at BCH and other specialist TB centres. This study is limited in that it is a single time-point study. Nevertheless, it highlights the complexity and severity of patients admitted to a district-level hospital with specialist TB services in South Africa, whose patients are cared for by medical officers with limited training in HIV medicine. Outreach to these hospitals by physicians trained in infectious diseases and HIV medicine to support patient care and transferring skills to the resident staff is needed in all but a few hospitals that already have trained staff. As a result of this study, an outreach programme has been running at BCH since October 2008. Our findings highlight infection prevention and control as a further cause for concern. Movement of patients with drug-resistant TB between health institutions should be avoided wherever possible. Rolling out ART on-site at BCH drastically reduced the movement of TB patients from the hospital to peripheral HIV clinics, thereby reducing the chance of TB transmission to susceptible patients. The finding that many of the referrals to higher levels of care were initiated by ultrasound or CT scans, suggests that increasing radiological resources at the hospital would reduce the need for transfer and potentially prevent nosocomial transmission of drug-resistant TB. Furthermore, increasing outreach by specialist services such as psychiatry and infectious diseases from higher levels of care would further support resident staff and patients, while reducing the need for up-referral to other health care facilities. With bed shortages and pressure on secondary- and tertiary-level hospitals owing to the high burden of HIV and TB in South Africa, the continued admission of patients that do not have a confirmed diagnosis of TB to these hospitals remains a problem. As highlighted by Thanassi et al., such patients are less likely to transmit M. tuberculosis and they occupy hospital beds that are earmarked specifically for TB patients.5 Training resident staff in infectious diseases through improved outreach programmes helps to identify such patients and enables relocation to more appropriate facilities, thereby increasing the number of beds for bona fide TB patients. In conclusion: BCH, a district-level hospital providing specialist TB services, and one of many throughout South Africa, houses sick, complex, acute patients with multiple co-morbidities, who commonly require up-referral to higher levels of care for imaging and consultation services that could be easily posititioned at this type of facility. The increasing burden of drug-resistant TB is equally felt at BCH and also associated with a high frequency of co-morbidity that complicates patient care. Outreach and skills transfer from secondary- and tertiary-level physicians is an important component to support district level hospitals that provide specialist TB services in South Africa. We thank Dr Erma Mostert for allowing access to patient charts, and Professor Gary Maartens for his input during the writing of this paper. HvdP was funded by, and MM received support from, PEPFAR/USAID through the ANOVA Health Institute.